(Newser) – The Ben and Jerry of Ben & Jerry's were among hundreds of people arrested Monday in a protest at the US Capitol over what they perceive to be a corrupt political system. 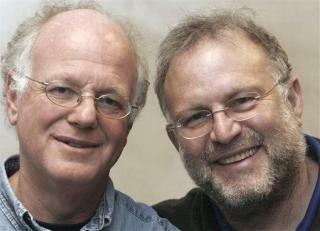 Ben Cohen and Jerry Greenfield were taking part in a demonstration by a group called Democracy Awakening, and they were two of about 300 arrested on Monday, reports CNN. Like most of the others, the ice cream moguls were processed at the scene and released by Capitol Police on misdemeanor charges of "crowding, obstructing or incommoding," reports the AP. Time to boycott "Ben and Jerry", no more overpriced ice cream!!! The real crime is when they removed Oreo-brand cookies from their "Mint With Oreo Cookies" ice cream. Cheapskates.